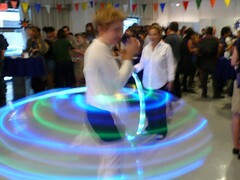 So the event for “An Evening At Maker Faire” for Internet Week NY on June 5th went very well. I had a spot near the center of the room so it was easy to get everyone’s attention. Nearly everyone who passed wanted to try it out. I had two hoops both the same standard size 40 inch diameter by 1 inch thick versions but one was powered by a standard lithium battery and the other was my new rechargeable version. Everyone I asked said they couldnt tell the difference by weight and felt they were both fairly balanced. I did have one lady tell me it felt too light. But she was used to exercising with a 3 lb hoop. My hoops are only about 1.5 lbs. But for others who were just dancing/performing with it, the weight seemed ok. If you need to you can always add weight to it when you build your own. I hooped for Channel 4 News, and really embarrassed myself. Then I was interviewed by Intenet Week NY, they asked what I did, why I did it, and what I thought of the future. I remember it going very well but I haven’t seen the footage yet. So hopefully I didnt say anything too stupid. I do remember stating that the next cool gadget won’t come from Apple or Microsoft but from Independant Makers working in their homes, garages, or studio apartments like myself. I’ll post a link to the video as soon as it goes live on their site. Of course they asked me to hoop for them, embarrassed again, but this time I had some help from my wife. I also had a sign posted above my table that you dont need advanced tools or a workshop to make your own products. I work out of a 400 sq ft studio apartment. My most common work surfaces are my floor, my bed, and a 16inch fold up table from Target. My most valuable tools are a leatherman multitool, a battery powered screwdriver with drill bits, and a very supporting wife. I think some people got a kick out of that. As usual it was funny to hear people’s first reactions to the product. Some grab it, try it and immediately love it and never give it back. 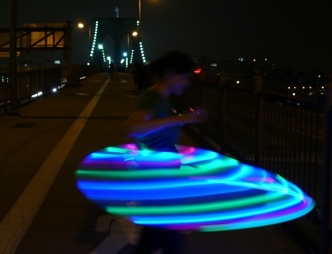 Others grab it and pause to ask “what does it do?” And I say … “its a hula hoop with lights in it”. When I see their dissapointment I show them photos of other people making streaming colors and then they say “wow. cool!” and hoop for the next 5 minutes. 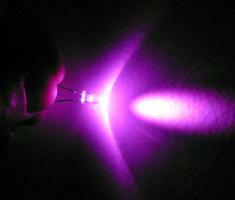 But some are also asking if it reacts to your movements or creates patterns. Currently 7 of the 21 LEDs slowly cycle through the colors independant of your motion. But this is a DIY kit that is supposed to encourage creation and modification. You can definitely add a microprocessor to it to control colors and react to motion, but I dont have a kit for that just yet. I met someone towards the end of the show that wants to add some intelligence to the hoop and hopes to showcase it at my next workshop (most likely at the end on July). Maybe he’d be willing to help someone add it to their hoop as well. One thing I think I might change is start to offer fast changing color LEDs, because some didnt notice the LEDs slowly changing colors. When I was a child I love playing this hula hoop. 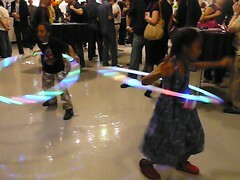 Now my kids liked hula hoop also. Any, thank you ifor reminding me of my childhood. “The bravest thing you can accomplish when you are not brave is to admit courage and proceed accordingly.” by Corra Harris.